The S2C Community is just that……. We had a great volunteer training session on Wednesday this week (first of five so still time to join in with us) that was very much volunteers sharing their skills and knowledge of good practice. We are very lucky to have such a diverse mix of people with different skill sets that they can share to help everyone who volunteers do the best they can to support those that need it. S2c is a bit of an odd place to volunteer in a way. it is not as clear cut as other organisations really as it is very difficult to assign set roles. I am guilty sometimes of not really explaining well how it works! For a start with some people being a volunteer is as much a part of their recovery or need for support as it is any of the service users. Some people volunteer because they want to help others and are in a position to give time. Some people volunteer because they are lonely and feeling isolated. Some people volunteer because they are on a road to recovering from some kind of illness and it is a step in that recovery to help them move forward. Some people volunteer to help develop skills with a view to gaining experience before heading to further education or indeed seeking a job in a related profession. Some people volunteer to say thank you for helping them by giving their time in return. Sometimes a person will volunteer because they don’t feel they want to be a service user but want to be part of the mutual support and ethos we have. People volunteer with us for many reasons, all perfectly good reasons and we benefit. We also hope very much that our volunteers benefit too in some way. S2C is very much a community in that everyone from the person in charge, the volunteers and the service users all share responsibility for the organisation. If a job needs doing then somebody will do it without needing a label. The floor needs mopping, an exhibition needs hanging, toilets need cleaning, store room needs tidying, a form needs filling in, a risk assessment needs to be done then one of us will do it. If somebody does not know how to do a job then someone who does will show them the first time. The art sessions are one group working together and sometimes it is difficult to tell volunteers apart from service users. Perfect. In that setting with everyone sharing, helping and supporting each other, then it gives individuals the confidence to grow from a very low place or from somewhere a bit more settled. We all take responsibility for each other and the putting away, making drinks and cleaning up. Clearly that happens with the safeguards in place. There is a structure there for more support, reporting, handling confidential situations and referring on to other agencies if needed. With everyone involved, everyone has ownership of S2C to contribute as much as they feel they can which makes the space a very healing, friendly and accessible one for those who are struggling or feeling vulnerable. In August we are planning a “Summer Exhibition” with contributions from everyone who is involved with S2C in any way. 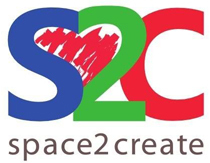 We want to celebrate the S2C community and all the good work that goes on from all the service users, volunteers, partners, supporters, funders, groups hiring rooms, artists and individuals who have some involvement with S2C. …….With a little help from our friends. This week has been a very rewarding one for me in the sense that it has seen several different projects developing or concluding that are example of working together to provide support for people who need it most. First of all we saw the final showing of Sharon Tait’s epic undertaking of 100 artworks in 100 days. This was shown at our unit in Kendal then over at Walney Community Centre all part of the celebration of Leonard Cheshire’s 100th birthday celebrations where people were asked to do something to raise awareness that involved the number 100. Sharon decided to exhibit and sell the pictures raising funds for Leonard Cheshire over in Walney and Space2Create as she volunteers for both organisations. This has also developed as we are looking to bring a Space2Create session to the Walney Community Centre. It is great to be able to link with a great organisation like Leonard Cheshire doing amazing work in Walney and hopefully we can bring an extra dimension to what happens in the local community centre. We also saw the start of a new afternoon group at our Unit. Working with South Lakeland Carers we have added an afternoon drop in on Tuesdays from 1.30 pm aimed at carers but also for any of our service users and anyone who would like to join in! One of the carers who came to the first session summed it up perfectly saying that it was an opportunity for some “me” time and how much just being and creating had made them feel great. Also this week was the final led session for the Sedbergh Archive Project. The collaboration here is great with a Heritage Lottery Grant, the inspiration of the Sedbergh School archive and the chance to work with a great local print maker in his studio with our service users next week going over to Ben Dodge in his studio to develop the designs we have created. In the coming week we also will be celebrating being part of the Gateway Group that brings together many local charities with shared resources and information. On the 22nd from 2 till 7 in the Town Hall we will be having a table with information about us and what we do along with all the other members of the Gateway Group to showcase the group. You will be able to meet and talk to many of the people involved and hopefully we will have somebody there most of the time. Well there we are. A bit of a bland blog really, an important message about the power of mutually supporting each other to support those in need. Well actually what I wanted to do was rant about how the country is being turned into a giant private enterprise zone with everything being a profit driven business model. Then I was going to really rant about how some things can’t be run like this. Yes it is inefficient to have a fire station in a particular area but it still saves lives which is the whole point. Increasingly it seems that the people on the ground, whether that be the immensely brave emergency services tackling and trying to rescue people in a burning tower block or the NHS staff working hard day in and out to keep people safe and well, are ignored, overworked, underpaid and treated like business assets. I find it morally rephrhensible that there is any situation where the support of the vulnerable, the protection of our communities or the wellbeing of the people is any way driven by profit. Anyone making profit from any persons misfortune is the lowest form of scum. And yet it seems that “privatisation” is the only model that successive governments subscribe to. It seems odd that so very few of the businesses that provide private public services are not for profit organisations and one has to a second look at who the directors and share holders are in these companies………. Okay, mini rant, feel better………..well no, actually I feel angry! Some of our not for profit artwork by our very vulnerable service users mostly assisted by unpaid volunteers this week…. Where are we going with this? Managers Blog: Where are we going with this? I often ask myself where is S2C going? By that I mean what is the ultimate goal, what would we like to be doing. In some respects we have so much going on and yet in other ways there is just a core. The core is the drop in for people who are struggling with mood, self confidence, esteem, loneliness, isolation, illness. We run those drop in session continuously and numbers go up and down week by week. That was the whole point. No pressure and no requirement just an opportunity and a safe place to go. But then there is all the other things we make happen or give opportunity to happen. The gallery space has given many of our service users and local artists the opportunity to exhibit, sometimes for the first time, in a safe and supported space without a great deal of pressure. Particularly for our service users who are often anxious about being exposed to scrutiny. The space is and has been used to make groups happen that otherwise might not have. County Council adult education courses, Cumbria Mental Health Team group sessions. We help an art group for adults with learning difficulties by giving them space to do art after their premises were flooded. There is a massage business that’s just started up we help by giving cheap space, a meditation group that couldn’t find affordable places to meet. Artists hire space to run training and art courses and we work with a local gallery to run a dementia group at the unit. Local arts groups put on exhibitions with us. We get involved in local festivals and events and we run sessions at the local hospital. We exhibit art work at the Leisure Centre and in local GP surgeries. All this shows that in a way we are becoming a creative community centre and perhaps that’s where we should aim to go. A safe and welcoming place in the community where anyone can come to be creative, show creativity, enable creativity, promote creativity and above all give opportunity to the vulnerable in the community to recover, grow and belong. All this takes volunteers and staff. As we grow and add new things it all needs extra volunteers to make it happen. For the first time in the last year we have had some paid staff undertaking specific roles and where funding allows this needs to develop and continue. At the end of all that though, the main purpose of all this is people. If in any given week we help one person feel more positive about themselves and confident which means they survive the week then it has been worth the effort. Soooo, trying not to be political or biased to a particular party. Very difficult. I have explained before how we avoid taking sides, not least because of the stress and division this causes during sessions. We are not there to judge people s political views and as a democracy people are entitled to vote however they wish. At the same time the election is a hot topic. One that does cause those who are vulnerable in our society to become anxious and stressed. How do I know? We witness this over the weeks building up to elections and referendums, individuals feeling just a little more pressure in their lives when they least need any more. Instead what I am going to do is let you have the “Space2Create Managers Wish List” available to all political parties free of any consultancy fee or bribe, I mean donation. Remember its a wish list and only there as suggested guidance for policy makers. How can I justify this wish list. It is what I experience with our service users weekly. I would like there to be enough NHS mental health staff so that when I or my Service Users go to our GP with a mental health issue the first place they recommend you to go for help is not a local charity. Don’t get me wrong, the charities do amazing work but should they be the frontline? I would like there to be enough NHS mental health staff so that Service Users are supported by more than occasional telephone calls from a crisis team, especially when they are self harming or having suicidal thoughts. I would like there to be enough mental health hospital beds so that those Service Users who are self harming or having suicidal thoughts are not left for days waiting for a bed to get the help they need. I would like there to be enough NHS mental health staff so that existing staff are not so overworked and stressed they end up on sick leave. I would like enough NHS staff, beds and funding so that Service Users in chronic pain, disabled by illness or with life threatening conditions are not waiting for months for operations or getting them cancelled at the last minute. I would like Service Users to get adequate support while they are unable to work so that they can live with some dignity without anxiety. I would like low income Service Users to earn enough for the basics of food, heat and power without constantly facing debt, eviction, hunger and shame. I would like Service Users with mental health problems and chronic illness to be fairly assessed for benefits and support without massive unnecessary anxiety, stress and shame. I would like my Service Users to walk through the streets without being abused or ridiculed. I would like my Service Users to not have to live in a constant state of FEAR. I would like it to be a criminal offence for any elected representative to lie to or mislead Service Users through campaigning they see on television and social media. There is a lot more but that’s enough to be going on with. I know that there will be some who will blame our Service Users for the position they find themselves in or will deny that this happens or even tell us that we all have to share the burden of austerity. They are entitled to their opinions. I base mine on what is happening in the real world. That was an unbiased open offering to all political persuasions………..